The first is a gentle story contributed by Colleen Hughes, West Felton local historian. The second is about one man`s love of the mules who saved many lives in the jungles of Borneo. Dolly lived with John Henry Jones and his wife Mary Jane, sons Eddie and Lawrence and daughter Doris (later Hamlett) at Keeper’s Cottage on the Woodhouse Estate. John Henry was serving in the trenches in Macedonia when, one Wednesday market day, Mary Jane went to Oswestry to sell her produce. She left Dolly with the trap at The Bear Hotel. When she arrived back at The Bear, loaded down with shopping, Dolly was missing! 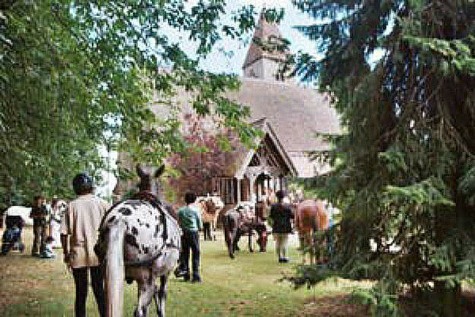 The Army had requisitioned all the horses and taken them to Park Hall army camp for transportation abroad. Highly indignant, Mary Jane marched all the way to Park Hall to persuade the Army that she couldn’t manage without Dolly. They finally relented, she walked Dolly back to The Bear for the trap, then they went home to Keeper’s Cottage where Dolly lived out the rest of her life. The Jones family eventually went to live at Ivy Cottage, Rednal. John Henry returned safely from the war and continued to work for the Woodhouse Estate for over 50 years. Colonel John F. Kenyon was born and grew up at Pradoe, near West Felton. In 1943 he joined the Indian Mountain Regiment and was involved in intense fighting in Burma. The regiment was to go into the jungle to harry the Japanese as they retreated north. It was decided that the staying power and agility of mules, from South America, would be the best mode of carrying armaments and supplies though the dense jungle where wheeled vehicles would have been useless. As the dulcet call of the mule would not be required when the soldiers were in the dense jungle harrying the Japanese, blowing bridges and destroying communications, so the animals were `devoiced` i.e. their vocal cords were removed. Next, the training was to develop a close relationship between animal and driver through the horrible conditions of the wet and humid jungle, covering up to 20 miles a day. When the monsoon started it was hell, elephant paths became rivers of mud which even the mules found difficult to negotiate. The men were soaking wet for days on end and plagued by leeches which got into their boots through the lace holes. The temperature in this soggy jungle was 100 – 120 and the men had to take plenty of salt tablets to avoid passing out. 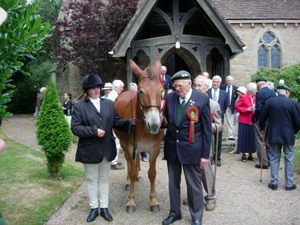 Throughout this nightmare, John Kenyon of leafy Pradoe in Shropshire developed a lasting affection for mules. One night during close quarter fighting with the Japs, a mule was badly wounded close to this trench. He got out to dispatch it, then returned to find that the trench had been destroyed by a shell. A mule had saved his life. After this particular battle at Arakan, Kenyon`s 7th Indian Division were flown straight to Kohima without any rest. On operations, the 3.7in pack Howitzer was transported in eight rapidly assembled mule-borne loads. The ability of the mules to operate in conditions inaccessible to vehicle-transport guns was a war winning factor. The war in Burma has the distinction that sickness played almost a bigger part than deaths or wounds - 25,000 troops fell ill from malaria, dysentery and diarrhoea over the campaign. The Battle of Kohima. Pouring rain, thick mist and the jungle terrain severely limited observation but John Kenyon`s coolness, determination, accuracy and prompt action during nine hours under continuous heavy fire provided invaluable assistance to the infantry and saved many lives. He was awarded the MC. Col. John Frederick Kenyon, M.C. died on 15th October 2006 aged 84. Animal lovers will be pleased to know that the mules, left behind with the people in Borneo, soon regained their voices. In 1944 Kenyon, a lieutenant, was serving with 5 (Bombay) Indian Mountain Battery, part of 25th Indian Mountain Regiment. On June 12 he was forward observation officer with a company of the 2nd Battalion, South Lancashire Regiment, which was mounting an attack near the village of Jessami, east of Kohima. Advancing in thick mist to within 40 yards of the Japanese, they suddenly came under heavy machine-gun, rifle and grenade-discharger fire from enemy entrenched in well-protected bunkers. Kenyon quickly brought down neutralising fire, which allowed the leading infantry to consolidate without further casualties. He then called down close supporting fire from two mountain batteries, which allowed his men to get within 20 yards of the bunkers before and led directly to their capture. Pouring rain, thick mist and the jungle terrain severely limited observation but his coolness, determination, accuracy and prompt action during nine hours under continuous heavy fire provided invaluable assistance to the infantry and saved many lives. 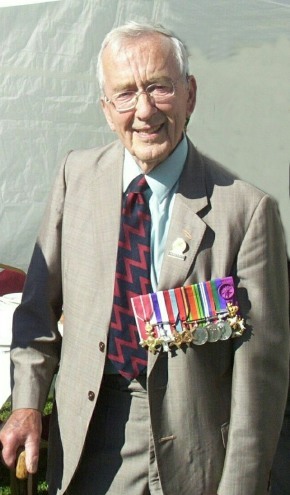 He was awarded the Military Cross.